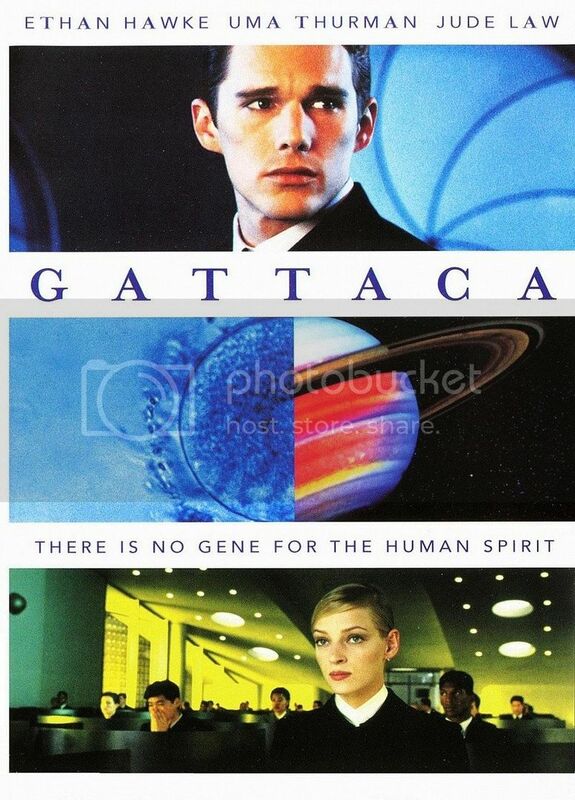 Just like Kramer vs. Kramer - a sexist movie about sexism - Gattaca is a prejudiced movie about prejudice. Yes, it's also very slick and stylish and clever (check out everyone's names - e.g. Eugene, "you gene", GET IT?). Yes, the music by minimalist composer Michael Nyman is cosmically evocative (indeed, his this inspired us to make our this). And yes, the set/costume design, with its sleek, clean lines and 1950s jagged angulariness, is very beautiful too. Well, maybe the plot first. We begin our tale following Any Dystopia's Requisite Bureaucratic Drone, Jerome Morrow (Ethan Hawke), and his clinical, fussy morning preparations. This man's breakfast includes placing tiny tiny vials of blood into tiny little fingerprint pads and then methodically gluing them to his fingers. Among other things. We soon learn that Jerome is actually named Vincent Freeman, and he is an In-Valid. That is, he's not a genetically modified super-person. He's just a guy with bad eyesight and big ambition. Vincent's world is a semi-Fascist gene-obsessed dystopia, where inequalities are perpetuated via parents investing in their kids' DNA. Being "Valid" - i.e. having been designed for success since fetus days - ensures you the best jobs, the best credit rating, the best life. Vincent, who dreams of joining the Gattaca Corporation and becoming an astronaut on one of their space missions, eventually finds - via a swarthy underground gene dealer (Tony Shalhoub!) - a way in: he steals the identity of a good-gene has-been, Jerome Eugene Morrow (Jude Law). Jerome - the real Jerome - was recently paralyzed in an accident, cutting his athletic career short and, it seems, his will to do anything. He's now all too happy to lend his now "useless" advantage to the under-privileged Vincent. The rest of the film is basically about Vincent trying to hide his identity, especially as an unfortunately-timed murder and attendant investigation come down on Gattaca Corp.
What then undermines this whole thing is how deeply, subconsciously prejudiced the film is. Some examples: well, the most glaring one is the fact that the hero(es) of the film, Vincent and Eugene, are polished, Anglo, white dudes. And that the only woman in the film, Irene (Uma Thurman), has no personality and is only present to be a love interest. So that's one prejudice in Gattaca: sexism. Let's see if we can keep count. Next example: The sordid underworld gene dealer is coded as a swarthy foreigner, played by the Lebanese-American actor, Tony Shalhoub. This, coupled with only one black dude in the entire film, gives Gattaca its second strike: Racism. And perhaps the most insidious example: Jude Law's performance was lauded and celebrated, and, indeed, it includes a number of "For Your Consideration - Academy Voters" scenes meant to elicit strong feelings. His character, Eugene, spends most of his days drinking away his obvious sorrows (cuz, you know, WHEELCHAIR). He is a self-destructive martyr whose only joy - he explicitly notes - is by living vicariously through the able-bodied Vincent. And that's the third strike, and it's a big one: Ableism. Oh my Lord, we hated this aspect of the film. It played into the most insidious, seedy stereotypes about being able-bodied or not, and basically gave the message that, "If you're in a wheelchair, the best you can hope for is to transfer your earthly ambitions to someone who can walk. And then just die." His entire characterization was meant to evoke some sort of sickly pity, we were meant to see him as a tragic figure. Lest it not be clear, we don't think wheelchair = pitiable tragedy! And it's completely ridiculous to say so! And, ahem, completely undermining of the film's whole point, which is about overcoming perceived physical challenge to, nonetheless, come out on top. And the film's other big point, which is that prejudice based on those perceived challenges is stupid and semi-Fascist. For these reasons - especially the last - we really kinda hated this film. Not recommended.